Dr. Edwin Wiley Grove envisioned the Arcade Building, built between 1926 and 1929, as a massive commercial mall with covered pedestrian thoroughfares and rooftop terraces surmounted by a skyscraper tower. It was the most ambitious project conceived by Grove, a wealthy patent medicine manufacturer, real estate developer and major benefactor of the city. Grove graded and cleared a site for his new building in front of the new Battery Park Hotel and hired architect Charles N. Parker to design it. Parker had worked for prominent local architect Richard Sharp Smith and later Smith & Carrier Architects (1904-1918) in Asheville before setting up his own practice. Construction paused when Grove died, but continued under Walter P. Taylor, who completed the arcade portion of the building, but with the stock market crash, chose not to construct the intended tower. The elaborate, Tudoresque building occupies a full city block with glazed terra cotta covering its reinforced concrete and steel structure. Deep barrel vaults form the major entrances, located at the center of each elevation, while a series of ramps to the roof terraces flank the main entrance at the north of the building. The two interior corridors intersect beneath the foundations of a tower that was planned but never built and form an octagonal space. Handsome wooden storefronts with similar Tudor Gothic Revival style details and cantilevered bronze stairs finish the interior. From the time it first opened until 1942, the Arcade was a booming commercial center for downtown Asheville. During WWII the Arcade Building was occupied and modified by the Federal government and eventually housed the National Climatic Data Center until the 1990s. 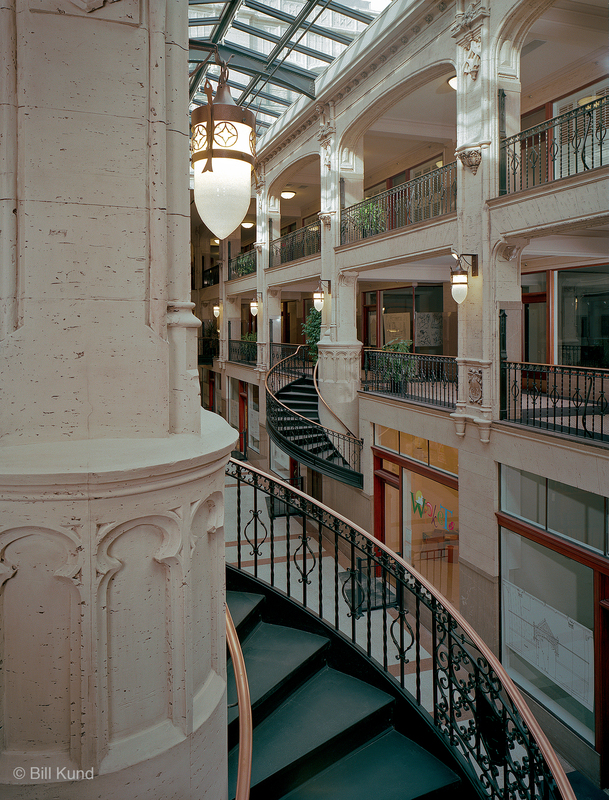 In 1985, under a Mayor's Taskforce, city leaders began negotiating a deal to restore the Arcade to its original commercial use. 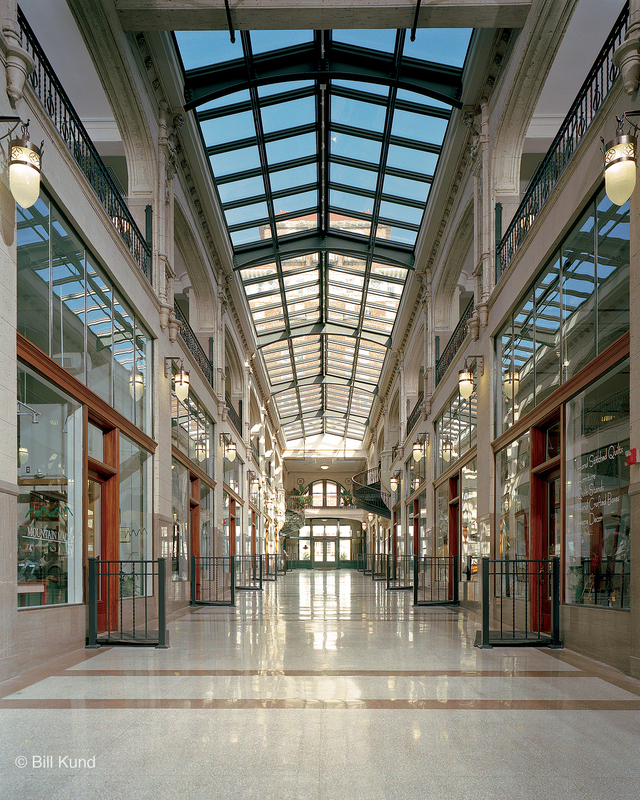 After undergoing extensive renovations, the Grove Arcade reopened in 2002 as a public market with several restaurants, fresh and prepared food vendors and mountain craft shops. The Arcade Building is located at 1 Page Ave. and occupies a full city block bounded by Page, Battery Park and O'Henry aves. and Battle Sq. The building is open to the public during operating hours of individual businesses. For further information visit the building's website.